It’s been nearly a year since we launched Firefox Focus for Android, and it has become one of the most popular privacy browsers for mobile around the world. In light of recent events, more and more consumers have growing awareness for privacy and secure products. The upcoming implementation of the General Data Protection Regulation (GDPR) in Europe later this month reflects this and, at the same time, highlights how important privacy is for all users. At Mozilla, we’ve always valued people’s privacy and given them the opportunity to determine the data they want to share. Last year we updated our Privacy Notice to make it simple, clear and usable, and we’ve been transparent about how we collect user data. We feel well prepared for GDPR coming into effect and Firefox Focus is one of the best examples of why: This mobile browser has been ahead of its time and is well positioned as the go-to mobile product in the Age of GDPR. Now, we’re making it even more private and convenient. Up until now, Firefox Focus blocked all first party trackers of sites that were commonly known to follow users from site to site, also known as “cross-site tracking.” From there, these sites collect “cookies” which are small data files stored by your browser. It helps publishers collect data to personalize your experiences with them. Again, Firefox Focus blocks first party trackers on the Disconnect list. Today, we are announcing a cookie management feature that also gives you control over the source of trackers that are following you. 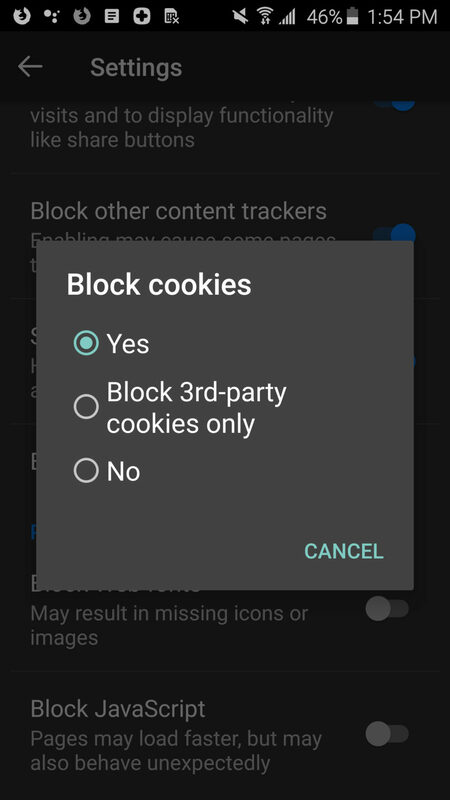 Users can now protect the visibility of their online activity through cookies on a site from other sites (third party), all sites – or not at all if they choose. You can find this under Settings, Privacy & Security, “Cookies and Site Data” to make your selection. There is a small chance that it it might not work on some sites, so we’re giving users the choice to turn it on or off. For example, advertisers use third party cookies to track your visits to various websites. In our previous release, we’ve included the ability to add favorite sites to an autocomplete list by adding them manually under Settings. We’ve noticed that this way might not be the quickest setup for some users. Starting today, our users will be able to conveniently and easily long-press the URL bar to select the site to add to their URL Autocomplete list. Now adding your frequently visited sites is even easier and will get you to where you want to go even faster. The latest version of Firefox Focus for Android can be downloaded on Google Play.